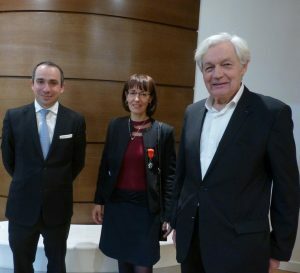 On November 29, 2016, architect Jean-Paul Viguier awarded the Legion of Honor to Laurence Dadillon, setec technical director. During her speech, Ms Dadillon said, “I accepted this great national honor in recognition of my professional investment and my 32-year career as a woman in the construction industry, because I identify with its founding values, particularly serving the public. Throughout my career, I have always tried to serve the common good rather than my own interests. A graduate of the University of Technology of Compiègne and later ESCP Paris business school at the age of 36, Laurence Dadillon started her career in 1984 at an SME installing boiler rooms and urban networks, before joining an engineering company, Séchaud et Bossuyt, as a climate engineering specialist. In 2002, Sfica asked her to breathe new life into its climate engineering department, a new management challenge she accepted. In 2007, she joined setec as director of its climate engineering department, and later become its technical director. Throughout her career, Laurence Dadillon has worked alongside renowned architects on high-profile projects, such as the Renault Technocentre in Guyancourt, Tour D2 of La-Défense, and Palais de Justice in Paris. In parallel, Laurence Dadillon has taught at Ecole Normale Supérieure in Cachan, and Ecole Supérieure des Travaux Publics.